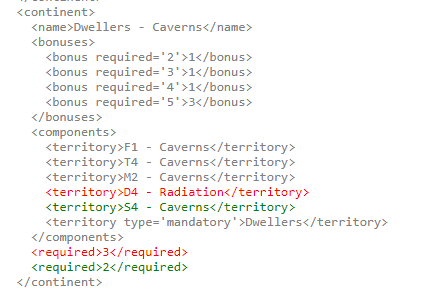 S4 seems to be miscoded as a "miner" instead of T2 and there's various other mismatches (radiation seems ok, the rest all seem to have an issue. 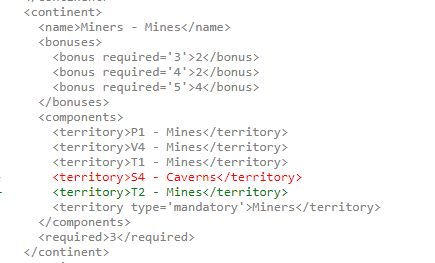 DrPsyPhi wrote: S4 seems to be miscoded as a "miner" instead of T2 and there's various other mismatches (radiation seems ok, the rest all seem to have an issue. I assume that the XML I sent that fixed that never got uploaded. I wish I could find the original art images or the xml docs but alas they were lost to the void of a failed hard drive. I would be happy if someone in the foundry could fix the xml and get this thing properly out of beta. I had originally proposed many changes to the map and the xml but the foundry was in a state of chaos at the time and nothing was ever done to update the map images or xml. I'll headline this and see if anyone is willing to help. There seems to be some other problem with it. The "cosmic" special feature doesn't seem to work how it should. I have 2 radiation and thus should be able to see every other radiation (and attack them), but I can't. Nor does 1 radiation let me attack forbidden land. Is that because it's fog of war, or just not coded according to the writing on the map? The bonus for the cosmic radiation also doesn't seem to increase per radiation held, like the map states. MadagascarAdam wrote: There seems to be some other problem with it. The "cosmic" special feature doesn't seem to work how it should. I have 2 radiation and thus should be able to see every other radiation (and attack them), but I can't. Nor does 1 radiation let me attack forbidden land. Is that because it's fog of war, or just not coded according to the writing on the map? 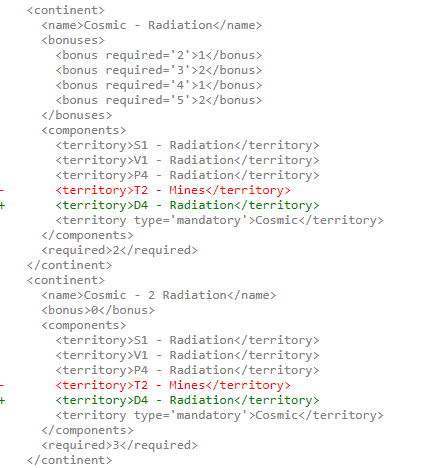 The bonus for the cosmic radiation also doesn't seem to increase per radiation held, like the map states. I don't know how often dolomite logs in, but I gather it's not very often. If you or someone else works out the correct version, I think he'll gratefully rubber-stamp it. Judging by the fact you got 3 +2 bonuses last round, I'd say you are a wizard with 3 terts next to tower. Can you see all 8 terts next to towers? If you can, you are a wizard, MadagascarAdam. Wizard is far and away the best. I played doubles with a wizard partner, but we could see he was a wizard. So, you might be a secret wizard. But, if your coding is screwed up, you could be something altogether different. Whatever you are, it's better than Cosmic. If XML is going to be edited, some balancing should be done. I already knew wizards always win, but apparently Cosmic is coded very similar to a wizard. I'm curious about whether you can see all 8 tower terts. Point being, the coding is messed up. I really do have a good deploy just because I've taken a lot of territories. Which makes the fact that I screwed up my reinforcement at the end of my last turn really sucky! haha! Willing to have a second look and/or lend a hand, if one or both is/are needed. I understand, was trying to force you into a defined special feature. You are just a miscoded cosmic. I can't unknow that, but I don't think it will be a problem for you. The XML for this map is very confusing, but I'm looking for bugs. The coder seems to have used every special tag and coding trick available. Just found a big one, because of improper use of mandatory type, everyone has the fanatics special feature in addition to the one they know they have. I know because I just picked up an unexpected +2 and had enough evidence to find it in the XML. But, that might not explain all surprise bonuses. We need to see how often the mandatory type is used. I'm not sure how the fanatics thing appears in log, not unless I hold it when my turn comes around. I found it in the information provided by the panels interface. And don't worry about me cheating, I'm too confused to know how to exploit anything discussed here. I'm too busy to actually spend time doing more than playing, but I'm considering helping out with this project if I can find the time. I like the board and would like it to be something that relies as much on strategy as on luck.. Not to take anything away from Mad, but I've played this enough to know that luck is a factor. Here's a big caveat. I may be wrong, I just started reading up on how the various tags work, today, so it could be that mandatory type is being used correctly. It's too soon for me to cast doubt on someone else's work. Sirius Kase wrote: Just found a big one, because of improper use of mandatory type, everyone has the fanatics special feature in addition to the one they know they have. I know because I just picked up an unexpected +2 and had enough evidence to find it in the XML. But, that might not explain all surprise bonuses. We need to see how often the mandatory type is used. Well, one thing I just realized about my cosmic special feature is that 1 radiation territory gets me *nothing* (even though it should get me one). I probably knew that on my first or second turn in the game but forgot it. Anyway, when I had TWO radiation territories, it got me 1 bonus deploy (instead of 3 total like the way it's written on the map), and now that I have 1 radiation (since you attacked my other one, haha!) I got nothing. So, apparently they coded the 2-radiation equals 1 army thing correctly and just left out the 1-radiation equal 1 army altogether. Regarding the fanatics bonus, I don't know how it works for you, but I'm definitely NOT receiving anything like that. I added up all my territories, etc., based on the map's description and the deploy I received for both of the last two rounds (excluding the radiation from the round before last) were exactly as was written on the map itself. I received 3 armies for 3 favored territories, 3 armies for 6 adjacent-to-favored territories, and 3 armies for 9 basic land territories. All of that is exactly how it's written on the map, without fanatics bonus. So, not sure of the XML at all (because I don't know XML) or how you got the fanatics bonus and what-not, but for me so far the only error is still regarding the Cosmic feature. The 1 army for 2 radiation is working, but the 1 army for 1 radiation isn't. Also, the movement from radiation to forbidden lands or other radiation hasn't worked at all yet (with my 2 radiation being the most radiation I've had so far). Anyway, I'm making my moves with the intention of gaining bonus, and I don't even have a decent functioning special feature to help me with that (I gave up on pursuing the radiation features since it didn't really help as much as the others since it's primarily not functioning as it should). So, whether or not this map is imbalanced, I can't say, as this is my first time to play. But just with the standard bonuses available to everyone, I've done fairly well so far. And sure, luck is definitely a part, as it is on every CC map. I've had fairly good rolls for the most part, so I don't doubt that helped me get a jump start on things. Sorry about taking that, I would have taken it anyway since I was trying to figure out conditional boundaries. But, it enabled me to see for myself what you were talking about. I figured out a work around, not a good one, just a little knowledge that will improve you game. The problem is that in some places your feature is coded correctly and in one place it isn't. To get your special feature, you must have 2 radiations, but 1 of yours doesn't count. I posted the link to XML in game chat hoping you'd figure it out yourself. I don't want to be guilty of secret diplomacy. So, there is a miner that counts as a radiation. If you have him plus one of the radiations that count, your transportation will turn on. Or, you can get any 2 of the terts that count, but one of the terts marked as radiation doesn't count. And, I think you have it because you did at one point, when I could see it. So, it doesn't count. However ,when you get 2 that do count, then I think it, too, will be part of your conditional transportation. I don't know, but you will be able to confirm whether the troop bonus will happen. You can take the tert from me, then go find one of the other 3 that count. Two are marked radiation and one is marked miner. That's been said upstream from here, more than once, so you don't have to read XML to figure it out. There is no way for me to see game from your POV, so see if you can verify this. I don't know any other way to do it other than by playing cosmic myself. If foundry has tools that would enable me to do that, I'll volunteer for the foundry team. Otherwise, this game, with so many different combos of features and species will be very hard to test and debug. So, find that miner or one of the other two radiations and take back the one I took from you and you should be able to verify whether there are other problems with your feature. I expect you to win, and I'm putting more mental energy into figuring out the map from my POV. Sirius Kase wrote: So, not sure of the XML at all (because I don't know XML) or how you got the fanatics bonus and what-not, but for me so far the only error is still regarding the Cosmic feature. The 1 army for 2 radiation is working, but the 1 army for 1 radiation isn't. Also, the movement from radiation to forbidden lands or other radiation hasn't worked at all yet (with my 2 radiation being the most radiation I've had so far). Anyway, I'm making my moves with the intention of gaining bonus, and I don't even have a decent functioning special feature to help me with that (I gave up on pursuing the radiation features since it didn't really help as much as the others since it's primarily not functioning as it should). So, whether or not this map is imbalanced, I can't say, as this is my first time to play. But just with the standard bonuses available to everyone, I've done fairly well so far. And sure, luck is definitely a part, as it is on every CC map. I've had fairly good rolls for the most part, so I don't doubt that helped me get a jump start on things. It appeared to you that you had 2 and I took 1, but because of the coding error, you had only 1 and I took it. So, now you know the one that doesn't count. So 1 army for 1 was working, and since the only radiation you have left doesn't count, you never were getting 1 troops for two radiation. But, when you get two radiations that count or one radiation that counts and that miner, you should be able to see all the radiations, and hopefully, the forbidden lands. Report your findings back to here, and then maybe me or someone else will know enough to fix problem. BTW, it's possible that our opponents are reading this, so if I seem vague, that's why. When I first read your post, I almost didn't say anything, then I realized we could debug the problem more easily if I didn't lurk. When I saw the announcement, then realized you were talking about our game, I thought about it first, and I hope I've said enough here to cover me in the event someone thinks we are doing something wrong. OK, yeah, I see now where the one territory was miscoded and I'm sure that's why my radiation bonus kicked in. I didn't realize xml was that easy to peruse. And as you've probably seen by now on game chat, the transport *appears* to work... though regarding the forbidden lands, I'd say probably not. (Harder to test that because now I have two territories with the tower thing). Anyway, no worries about people reading this, I always knew that was possible. Better to get it sorted out than to worry too much about advantage. As you said, I'm doing well anyway, so seeing the whole cosmic thing might not make much difference to anyone wanting to attack me anyway. I'm not worried, and I think I found the real problem. The api points at the wrong file. What I think is the right file was uploaded in 2016, but we are using a file that was uploaded in 2013. So someone with the right access has to do something about that. Foundry has been notified. sign-up for all of them today, while you still can! I've done some more investigating into the fanatic bonus, and it appears to be operating as it's should. Will spend more time on this after the holiday. hopalong's games all use the faulty xml file, so get familiar with dolomite's diff file posted above. I'm going to try not to help out in the game chat.